We want our clients to always receive the best service. 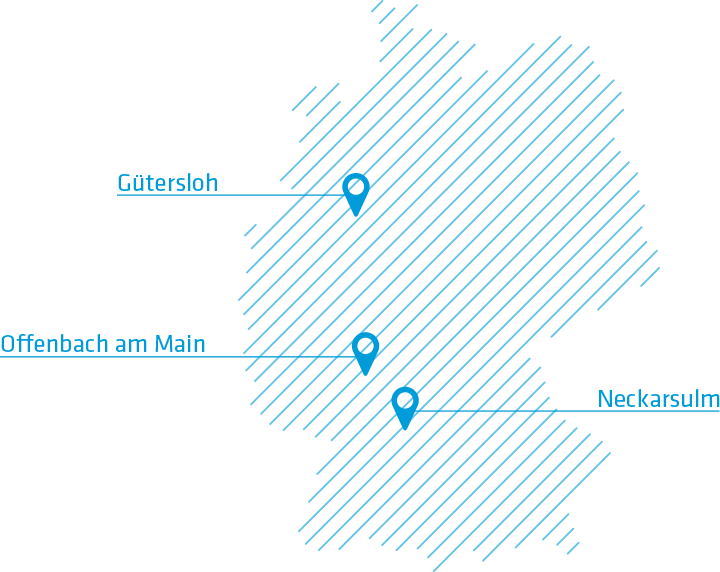 That is why our production facilities are spread across Germany at three different locations. This allows us to ensure flexibility and to quickly and easily reach our clients. Our head office in Gütersloh in East Westphalia is directly accessible by the Autobahn and is situated right near Bertelsmann headquarters. From here we manage Campaign’s activities and focus our corporate strategy. We also work from two other locations in Offenbach am Main and in Neckarsulm, which is in Baden-Württemberg. This means we can guarantee our clients flexible processing and secure scaling of their orders, plus we can spread innovation across Germany. Spreading our production across three locations means we can eliminate longer downtimes and offer a high degree of data security thanks to tried and tested backup scenarios. Every location has an independent business unit. We encourage each of our branches to take the initiative in conducting their business, and believe strongly in allowing them to act independently. At the same time, we at Campaign place great importance on our defined standards. As such, the management teams at each location all have the same tools and process definition abilities, as well as standardised scheduling and workflow management processes. This allows us to offer our customers the best possible level of service – one that is flexible and rooted in high quality standards. We’re happy to help – in Gütersloh, Offenbach am Main or Neckarsulm!